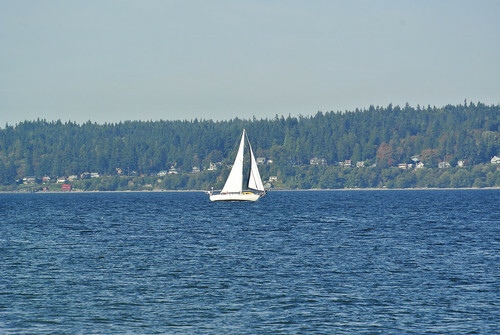 On a particularly warm and sunny day in early April I took a meandering ride along Lake Washington. 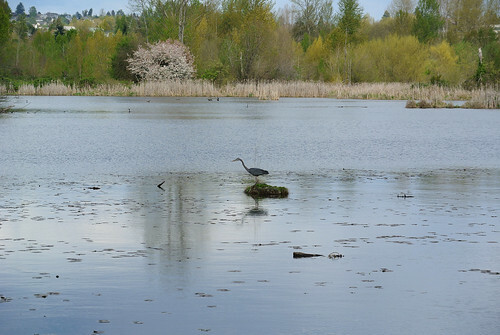 Riding through parks along the water and then I skirted the University of Washington along the Union Bay Natural Area the wildlife was out in force. 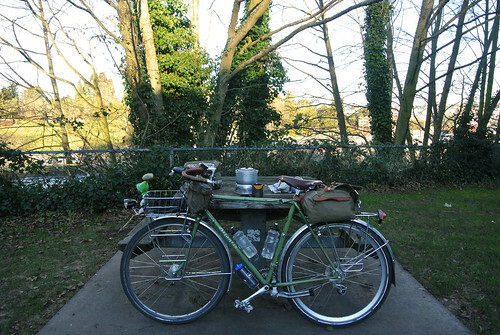 I concluded at Magnuson Park where I made coffee and hung out in a little nook next to the Community Garden. Here are a few photos from this beautiful early spring day. 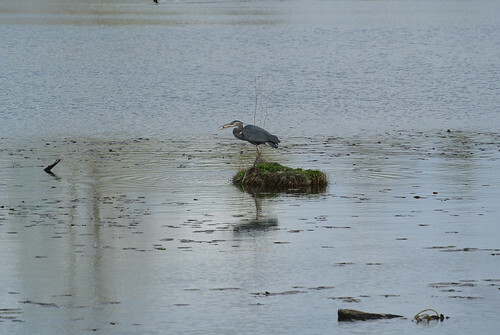 While at the Union Bay Natural Area I witnessed this Great Blue Heron catch and eat something. 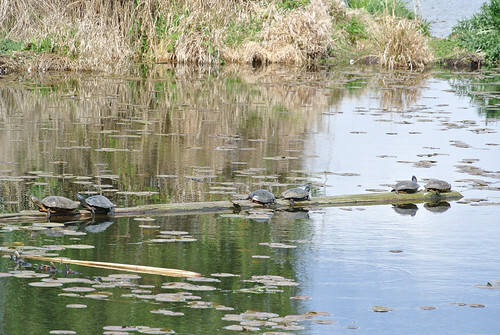 This log stretching out into Union Bay was lined with turtles sunning themselves. 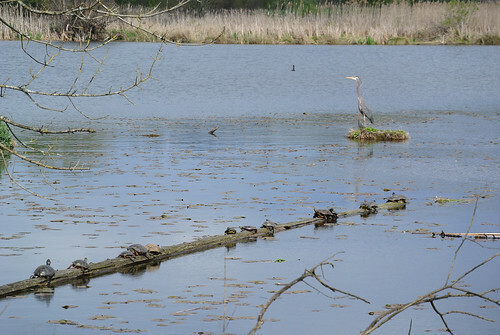 Log of Turtles, Great Blue Heron – life in Union Bay. 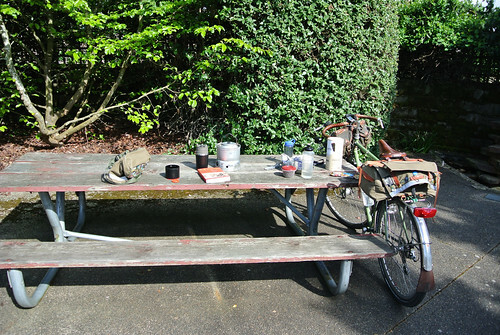 I concluded my northward wandering at Magnuson Park where I made coffee in a grotto next to the Community Garden. 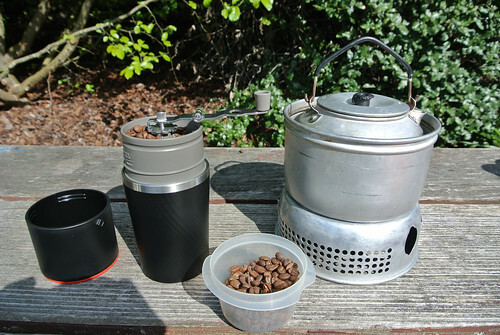 Next level Coffee Out of Doors: Pour over coffee with beans ground on site. Check out all of my pictures from this ride in my Early Spring Ride photoset on Flickr. 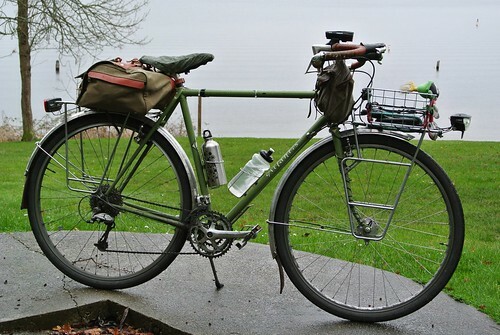 February 2005 my Rivendell Atlantis that I had ordered late 2004 arrived at my apartment in Woodinville, making it ten years old today. 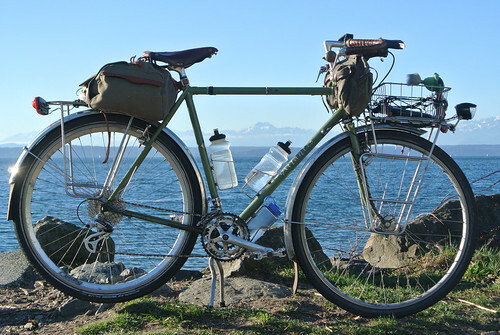 In the intervening years I have ridden this bicycle nearly 40,000 miles on many hundreds of commute trips, hundreds of errands, all over Washington State, across the country, into Canada, over the entirety of the Cascade Mountain range and most of the Sierra’s, in Seattle, San Francisco, Portland, Vancouver, Victoria, Minneapolis/St. Paul, Cleveland, across the Continental Divide, nearly two dozen states and provinces, countless county, state and national parks and on and on. Never has a bicycle fit me so well, or ridden so well. 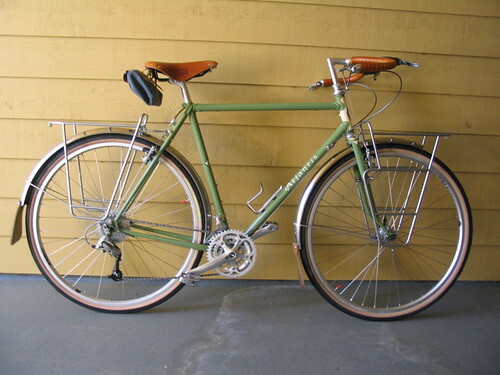 I’ve had other bicycles, even another Rivendell but I just ride this one. So happy birthday dear Atlantis and as promised soon I’ll be sending it back to Riv to be repainted and some minor repair. I’ve taken many, many pictures of my Atlantis most of which I’ve collected in my Atlantis Gallery on Flickr and even more via the Atlantis Tag. My Atlantis just after I finished assembling it. Not even ridden! The end of the 2014 has been marked by unusually wet and warm weather (pineapple express!) interspersed with unusually dry, clear and cold. Sure it’s not the approaching absolute zero of the midwest or what have you, but it’s been cold. However I wanted to get in one last ride for 2014, plus I needed to get some ingredients for a New Years potluck and I’ve had those coffee outside plans hanging fire so on NYE’s I set out for a little jaunt around the city. 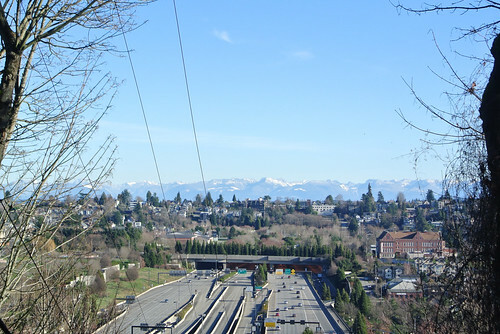 As always I set out late, so I rode across Beacon Hill, stopping only once at a stairway that gave me the above view of snow speckled Cascade Mountains. It’s only been four months since my summer tour in the mountains, and I have to say I’ve been pining for them a bit. Both the Cascades and the Olympics, snow covered, but well below average, are really looking lovely on these crisp, icy blue days. 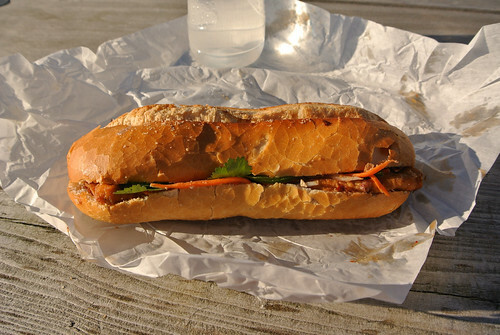 After this brief photoshoot I rode down the hill into the ID where I picked up Spicy Tofu Bánh mì for lunch at the always great Chu Minh Tofu & Vegetarian Deli. From the ID it was a short jaunt though Pioneer Square and the interminable construction to the waterfront where I had a wintery picnic. On the water there was stunning views of the Olympic Mountains across the Sound and Mount Rainier to the South, somewhat obscured by the Port and haze. While I was eating a train that was just five engines steamed up the nearby tracks. 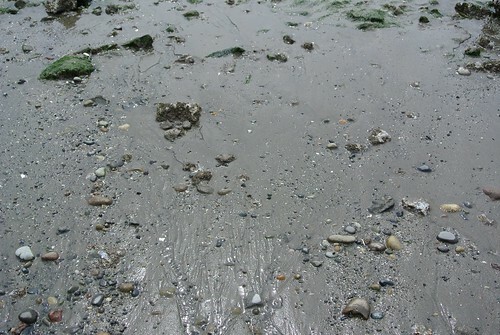 After lunch I took some pictures on the beach, but the cold air and fell winds soon pushed me back onto the bicycle. It was one of those days where you long for the climbs to warm you up and dread those icy descents. 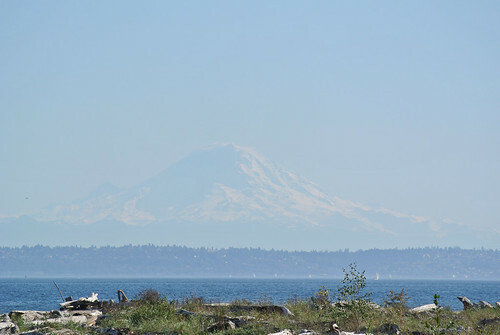 I rode up the Elliot Bay Trail and then did the a clockwise loop around the Magnolia neighborhood. 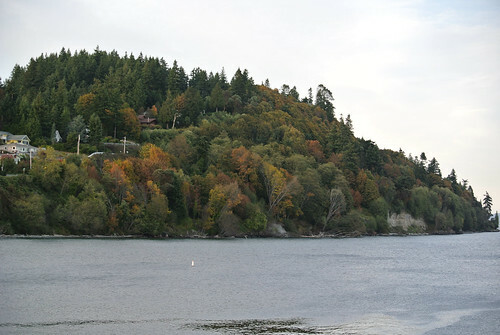 This begins with a good climb up to Magnolia Avenue which hugs the bluffs above the sound. 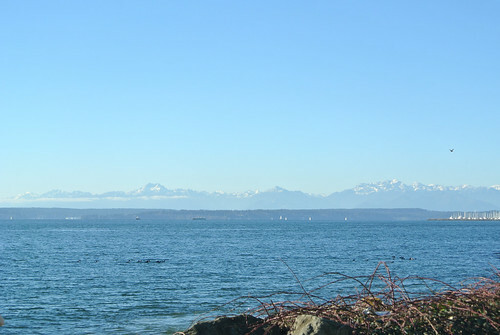 Some nice views south and west of the Sound, West Seattle, the Peninsula and the Olympics. I kept moving though and when the road turned inward a bit I took a residential road that dived down right to sea level and then pretty quickly followed was a steep climb out. 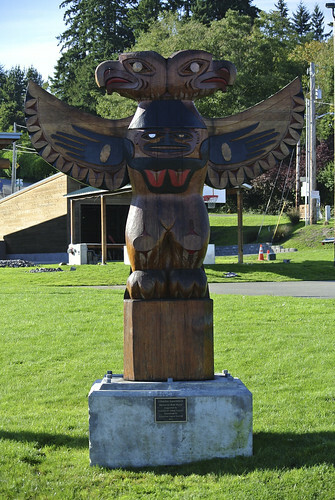 This brought me to Discovery Park which I pretty much just rode across and through until I was back on the scenic loop route. 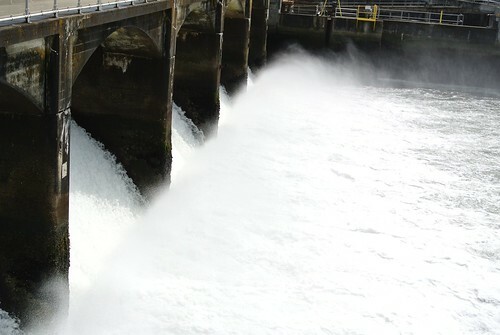 I cut over to the Ballard Locks and as I was about to descend down to the locks proper I noticed a little secluded picnic area. I decided to pull off over there and finally have make my coffee out of doors. Third time is the charm! It was much cooler in the shade (and it wasn’t that warm to begin with in the sun!) 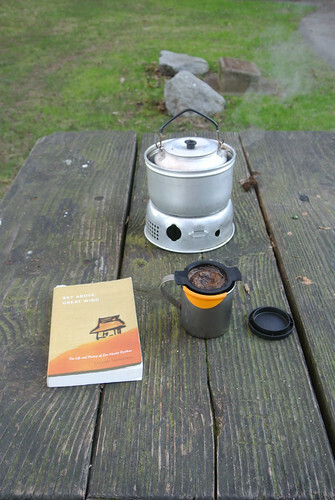 so I was pretty happy when the coffee was bile’d and I sat for a spell enjoying it in the company of Ryōkan. In town I finish begging for food. wondering which place to call home. Could that be my home near the white cloud? My coffee drained I was rapidly cooling down, so I packed up and headed down to the locks. There were people out at all the parks I visited on this day. It may be cold, but it is sunny and many people are off – I’m not the only one wanting to get outside. The locks were active as I was down there, a series of boats cruising into one of the locks and then slowly rising up as they are brought to the level the lake. A series of announcements from the Lock commander gave everything a bureaucratic edge. I walked my bicycle across the locks and through the park grounds and I was back on my bicycle. I rode through town and onto the Burke-Gillman Trail, which has a new separated bikeway in one of the previously more dangerous spots in Ballard. 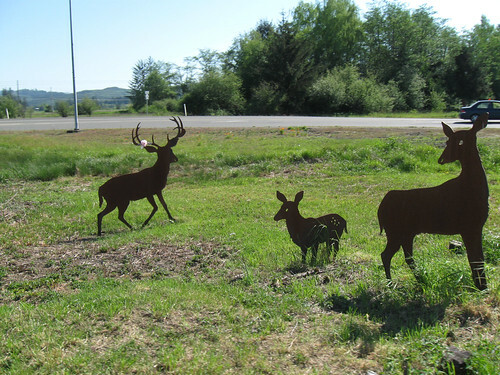 I took the trail to Fremont, where I stopped at the PCC and took care of that shopping I had to do. 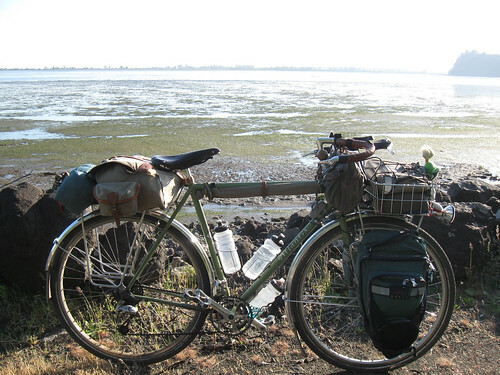 I loaded my groceries into my front basket – my saddlebag had my cooking kit and daybag in it – and in the now setting sun I began to make my way home. I took a mix of the BGT, waterfront roads to the U-District where I was able to take my old commute route. The sun had set as I climbed up Capitol Hill but there was this layered yellow-orange-red glow outlining the Olympic Mountains deep in shadow above the Space Needle and the Seattle skyline. Glorious. Since the traffic seemed fairly low on this NYE’s I rode on broadway and the entire length of the newish cycle track. There was still a glow in the sky behind Sodo and the distant mountains as I crossed the Jose Rizal Bridge and began my climb up to Beacon Hill. I arrived home around 5:25 in nearly total darkness after having ridden just over 25 miles on this cold, New Years Eve. A fitting end to 2014. More pictures from this ride can be found in my Last Ride 2014 photoset. It’s rare that these two significant holidays occur on the same day but instead of celebrating either I went for a rambling ride along Seattle waterways. The weekend had been rather grey and rainy and Sunday was expected to be similar but with that spring like character of occasional sun breaks. I’d been hankering for a ride as I’d spent the last weekend (which, of course, had been the nicest of the year to date) sick and was still feeling a bit weak and tired from that. When I got out of doors it was warmer than expected and while grey it was those high thin clouds the sun burned through. 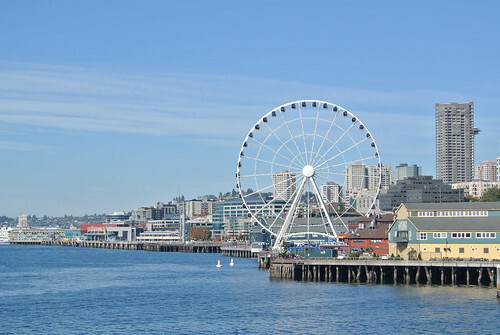 I rode through the ID and down to the Seattle Waterfront. The waterfront is under a huge amount of development with the former viaduct being torn down, a tunnel built under, the seawall being replaced and a park built downtown. Considering it’s a massive tourist zone makes for fairly chaotic riding. I stuck with riding on Alaskan Way except for a few bits where I was directed onto new Bicycle/Walkways. It being Sunday morning and Easter/420 it wasn’t all that bad. So I headed to Elliot Bay Trail at the entrance by the Olympic Sculpture Park. I’ve ridden this trail many times but this time as I neared the end, where I was going to begin a loop around Magnolia, I decided to do a clockwise loop instead of the usual anti-clockwise. So I hung a left on a spur on the trail and noted that it had an extension to Smith Cove Park. Well I’ve never ridden this section before! This turned out to be a fairly short stretch (less than a mile for sure) that wended around the rail yard on the east and a bluff on the right to this little park tucked in-between the industrial waterfront and a marina. I hung out at the park for a bit taking photos, reading and relaxing. The little park was empty when I arrived but three other bicyclers arrived whilst I was there. From Smith Cove Park, I rode down to the marina which also had a little park there and then I rode back on the Elliot Bay Trail spur and then took the exit for a clockwise loop around Magnolia. This begins with a nice climb up that bluff I’d just been under and then it was gentle ups and downs most of the way around to Discovery Park. 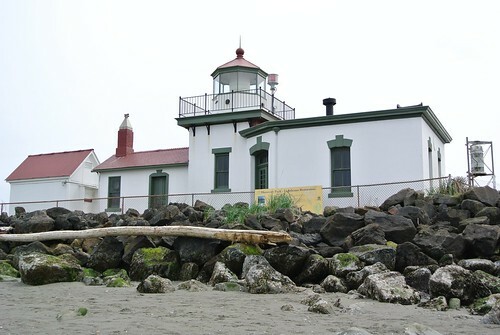 I rode through Discovery Park and then made my way down to the Lighthouse. This is down a narrow, steep road which always promises a nice slog up from the shore. Down at the beach there was more people than I’d seen so far, but the holidays I think kept it from being too packed. 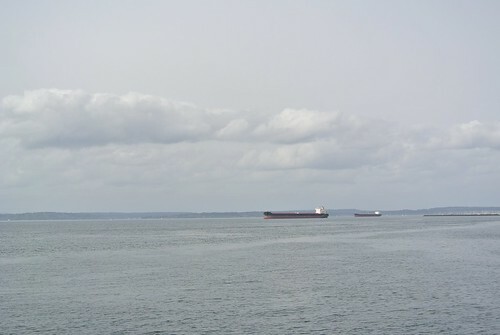 I spent a good bit of time on the shore, enjoying the pleasant weather and being on the water. I walked around the lighthouse and then sat on a log and read and watched for a spell. 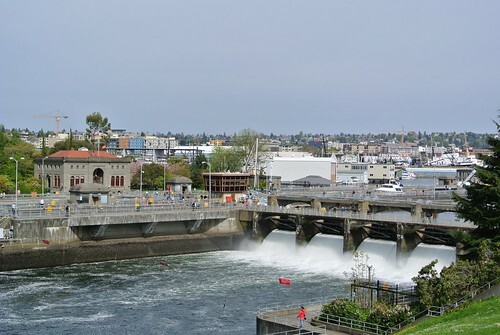 I made my way up the steep hill back into the park and rode some of the parks trail and closed roads to the northeast entrance from which it was a quick jog through the neighborhoods and along the Ship Canal to the Ballard Locks. 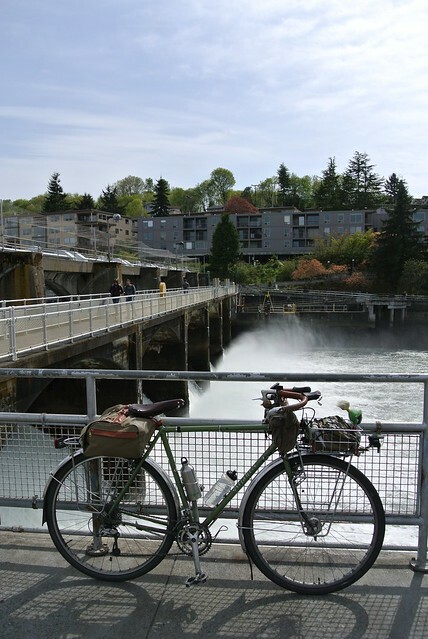 You have to walk your bicycle across the locks and on summer days the narrow walkways can be tough to get through – especially if there are people pushing bicycles through both ways. Today though, once again, it wasn’t too crowded even though now the clouds had burned off and it was sunny and warm. 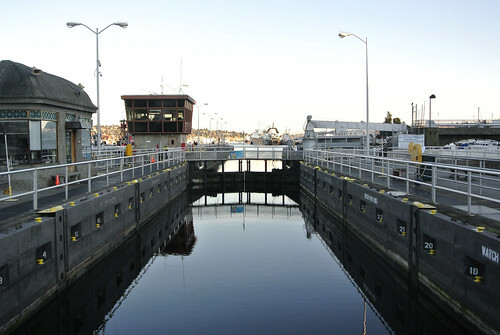 I lingered going through the locks, stopping at each of the sections to look into the water or take some pictures. But soon enough I pushed my bicycle through the park and reaching NW 54th Street I saddled up and begin to ride toward home. 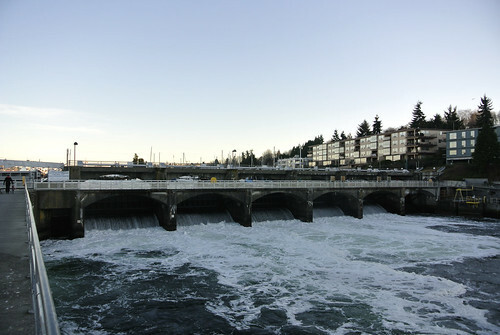 I cut though the industrial bits of Ballard to the Burke Gillman Trail, which was as busy as ever on a nice weekend day. I rode the trail into the U-District and there dropped off it and stuck with streets that were on the Ship Canal to the Montlake Bridge. 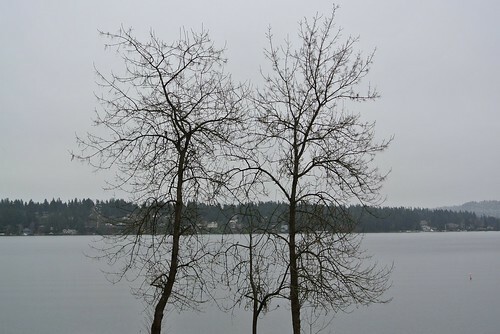 I then followed the Lake Washington Loop along Lake Washington until I rode up the hill to the I-90 Trail which I rode to the ID and then it was back home. Check out all the pictures I’ve posted from this ride: 420/Easter Ride. It’s been quite some time since my last point and while there is a backlog of things I should have put some work into there hasn’t been much of interest going on. 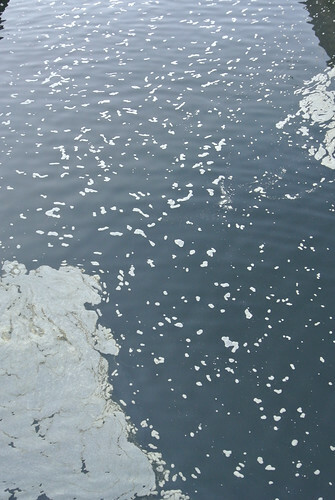 The winter doldrums perhaps, hindering rides and blogging past glories. There are a couple of events that happened at the tail end of 2013 that I should revisit: we shall see. Anyway the weather this winter has been pretty… variable, running from sub-freezing, clear days in January, to a couple of days of light snow to the more recent couple of weeks of rain and wind. The general malaise and this weather has kept me indoors even when I’ve been aching for ride. So this weekend I finally just bit bullet and headed out on Sunday a bit after noon (happy that the days are getting long enough that one can leave 12:30-ish, put in a 4-5 hour ride and be home before dark). 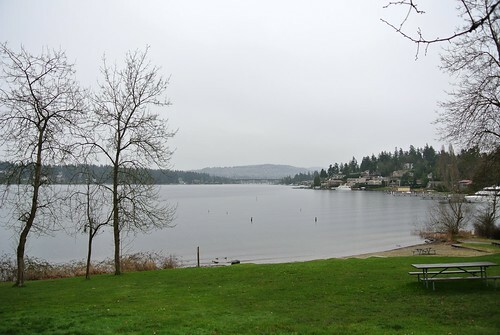 Since it was close to lunch time I’d packed a lunch and rode to Luther-Burbank Park on Mercer Island for a winter picnic. It had rained a bit early, but when I set out it was just a fine mist. That didn’t last and by the time I reached the park it was drizzling. I found a picnic table with one end under a tree and had my lunch. I then took pictures of the lake and my bicycle before I set out. These pictures were the only ones I took on this ride. 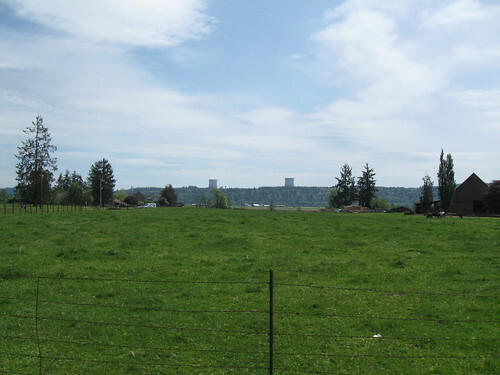 I had decided that I wanted to ride on May Valley Road which heads east through suburbia and then farmland around Cougar Mountain. 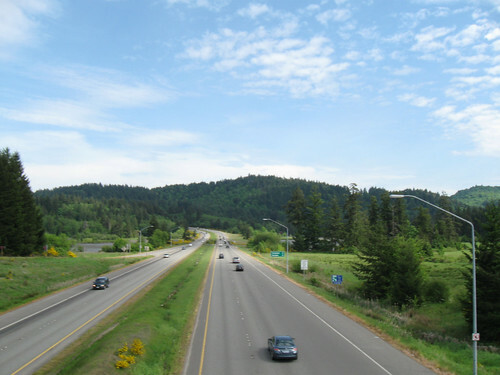 It intersects with the Issaquah-Hobart Road which rides between Cougar and Tiger Mountain into Issaquah. From there it is the I-90 “trail” (mostly on roads at this juncture) back to the I-90 Bridge where it returns to being a trail and I close my loop. This map is pretty much my route except that I started/ended a a couple miles west of Leschi. It was raining pretty steadily when I left the park and it pretty much rained for the rest of my ride. It increased and decreased in intensity but it was pretty much steady rain the whole time. I got pretty soaked due to waiting overly long before putting on my rain gear. May Valley Road is really beautiful in the summer as it descends out of the Newport hills into farmland but was pretty bleak in the winter. It was really flooded in the farmland in the valley center and while there are signs of spring everywhere (cherry trees, bulbs sprouting up and so on) it was pretty dreary. Interestingly all the various parks and trailheads I passed were packed with people – it’s reached that part of winter when people long to be out of doors. The roads were a lot more trafficked than I expected. 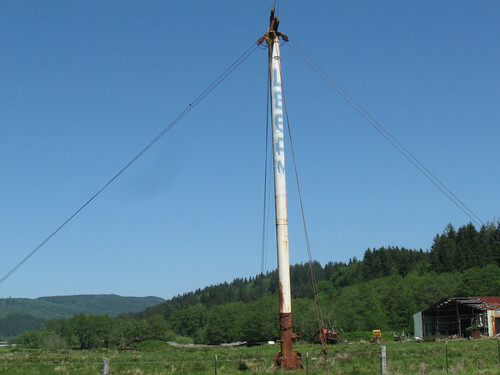 I guess it’s used as a way to get from around Issaquah to around Renton bypassing I-90. But kind of unfortunate. Anyway what with the rain and such I pretty much only stopped once post-lunch and I never did take out my camera again. One last thing worth noting is the updates to the Atlantis since I last posted. At the front of the bicycle you can see my new Busch & Muller Luxus-U LED light. I completely redid the wiring when I put this on, running the heavy duty Schmidt cable to my rear light. I have to say the light lives up to the hype and while I haven’t tested out the recharging aspect I expect that to work well. Thus this will be the third and hopefully the last charging system I’ve set up. The light is nice and bright and it’s integrated battery really is a nice feature. The light and taillight turn right on with even minimal movement and the stand light is of course appreciated. The only downside is that the wire on the attached switch/USB port is too short to reach from the front of the rack to the h’bars. I’ve got it mounted on my front basket which is okay, but really that should have been something one could get in different lengths. 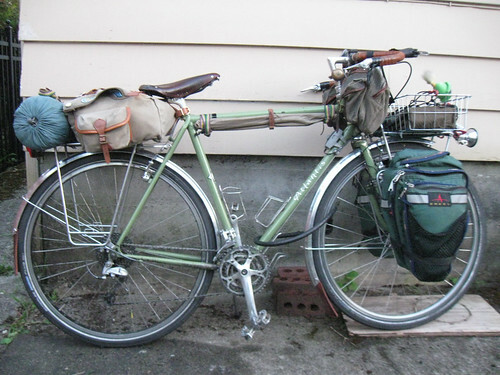 On the rear of the bicycle is a new saddlebag courtesy of Rivendell: a medium Sackville SaddleSack. My previous saddlebag is in need of some repair and since I need it for commuting I picked up this one. This is the third saddlebag I’ve gotten from Rivendell in this size range and I have to say it’s gotten better each time. Their bags are improved in every iteration based on the usage of a group of riders who use them daily. I’ve only had this a couple of weeks now but I’m pretty pleased with it. After an unseasonable cool and rainy September the first weekend in October was one of those perfect PNW Autumn days. I’d recently gotten a new camera (a Nikon 1 J2 for you trainspotters out there) and I went out for rides on both Saturday and Sunday with picture taking as a goal but taking advantage of the beautiful weather as my primary motivation. I’ve been wanting a bit more of a “prosumer” camera for a while with a goal of note only being able to take better photos but being somewhat forced into greater deliberation. That is I’ve done a lot of shooting “from the saddle” and I’d like to think I have a certain proficiency at it. While this allows one to easily document one’s travels it tends to generate a lot of photos and frankly I think this style of documentation just isn’t all that interesting. I’ve moved away from this style of photos in the last couple of years but I felt that having a camera where I’d have to get off the bicycle and spend time on each photo would further facilitate this. 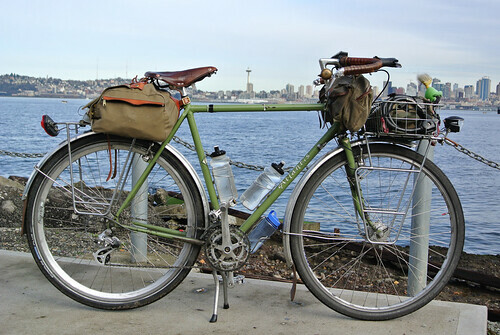 I initially planned to ride down to the Seattle Waterfront and meander along Elliot Bay, perhaps into Magnolia and along the Ship Canal. But as I rode down (heavily under construction) Jackson Street and then up Alaskan Way I decided instead I’d ride around Bainbridge Island. I turned off at the Ferry Terminal and caught the ferry ten minutes later – good timing! 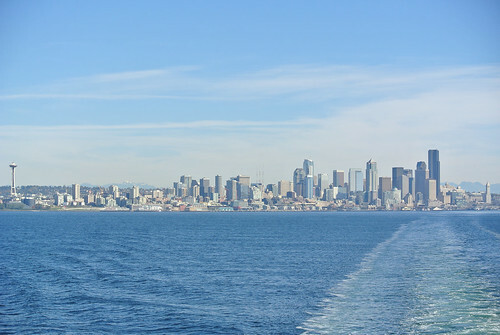 It was a fantastic day out on the waters and as Seattle receded in the distance our ferry was amidst countless sailboats and other recreational watercraft. 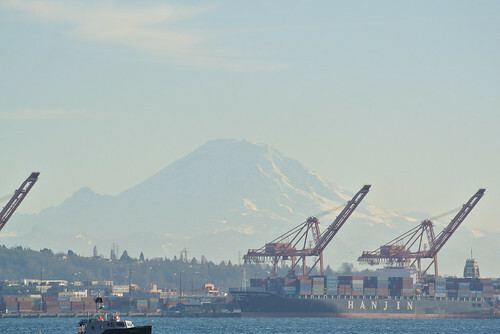 Mount Rainer, of which I would take many pictures throughout this day, was commanding to the Southeast, particularly towering above the West Seattle Bridge. 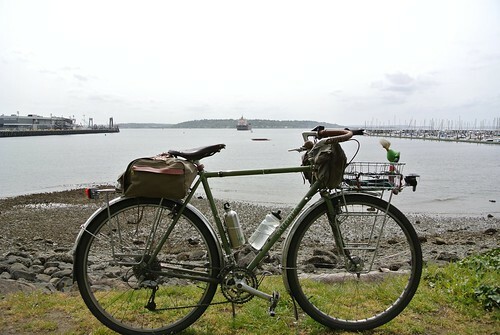 Arriving at Bainbridge Island, I quickly disembarked (always nice that bicycles are first on first off) and riding into town I quickly got onto the Chilly Hilly route which circumnavigates the island anti-clockwise. But as I was riding I began to think that I’ve done this loop plenty of times and it would actually be more fun to strike out on a more unfamiliar routes. 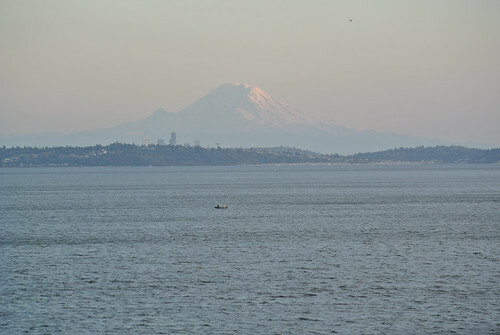 I began to think that I could pretty easy cross the bridge to the mainland and ride up to Kingston and take the ferry across to Edmonds and then make my way back to Seattle. So I pulled over at a little store and sitting on their porch consulted Google Maps and worked out a route. It turned out to be only 15-16 miles to Kingston from here, which seemed like a perfectly reasonable Sunday afternoon ride. 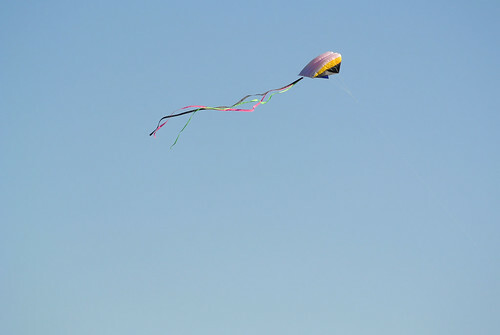 That settled I continued on to Fay Bainbridge State Park where I sat on the beach, ate a sandwich and watched the sailboats, kites and beachcombers. I didn’t linger too long as there was riding to done, but it was a pleasent break on the beach. From Fay Bainbridge I was able to stay on nice, country roads usually deep in the woods with occasional open fields of glimpses of the water, but eventually I had to take Hwy 305 off the island. Not a bad road as hwy’s go – big shoulder and at least on a sunday afternoon, not heavily trafficked. 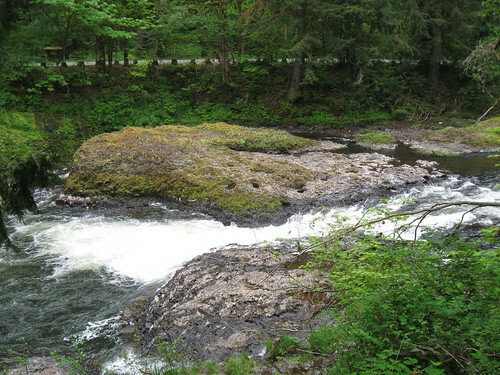 It crosses a nice bridge over Agate Pass after which I took an immediate right and headed north. This was a pretty busy road but again with a good shoulder and among the trees. 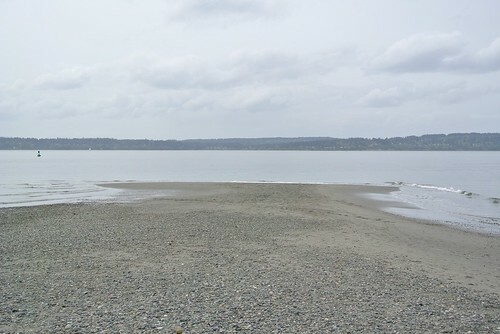 This road brought me to Suquamish which was right on the water. I made brief stop here primarily to take pictures and consult the map, before hitting the road again. From here the roads became particularly fine riding. Mostly in the woods a bit away from the coast, it was just ideal riding. Winding roads, a bit of up and down, brilliant colored trees amidst the evergreens all lit by the westering sun. I left the Google Maps route , following a red Dan Henry, at Indianola Road which took me a bit in the opposite direction of Kingston for a spell but was more scenic. Once again it was just perfect riding, especially once I turned onto South Kingston Road where the climbing I’d been doing turned to descending. This route descended down Appletree Cove on twisty roads through the trees. Very nice! After Appletree Cove, there was a slight climb and I turned on West Kingston road which heads straight to the ferry terminal. 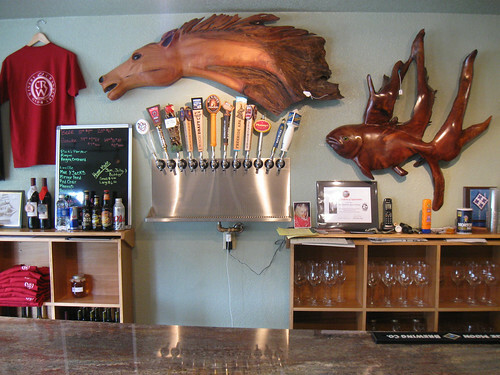 However I didn’t ride straight to the ferry – it being 5pm I felt a stop at the Front Street Ale house was in order. I checked on the ferry schedule and resolved to catch the 6:10 sailing and thus spent a nice hour drinking a couple of beers and eating a couple of appetizers. Fully sated I left the pub a bit before 6 and pretty much rode right onto the ferry just before the cars began loading. 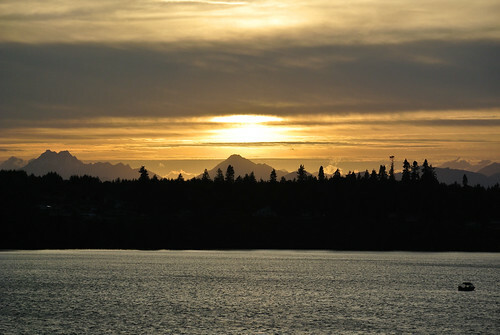 It was again a beautiful trip with the sun setting behind the Olympic Mountains and Mount Rainier, Seattle and Edmonds all glowing in magic hour light. It was deep twilight as I arrived in Edmonds and I had a good 20 miles or so to get home. I’d jotted down a Google Maps route from Edmonds to the Interurban Trail while on the ferry and in the dwindling light I set out on it. There was a pretty stiff headwind now and it was definitely chillier – I wish I’d brought some socks along! Google kept me mostly on the signed bicycle route and by the time I reached Shoreline I pretty much knew my way home. 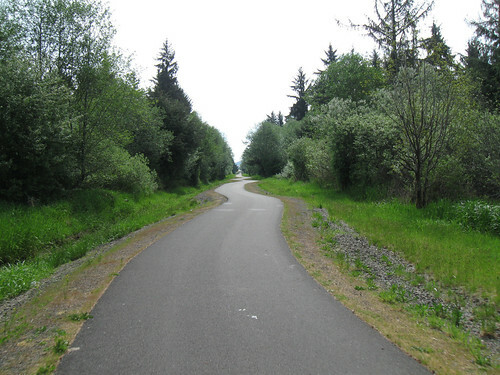 I took the Interurban trail – which has a nice new cycle track along Bitter lake – and then the signed Interurban route to Fremont. From there it was a short jog on the Burke Gillman Trail to the University district and then my commute route home. I made it home by 8:45 after having ridden about 48 miles all told. 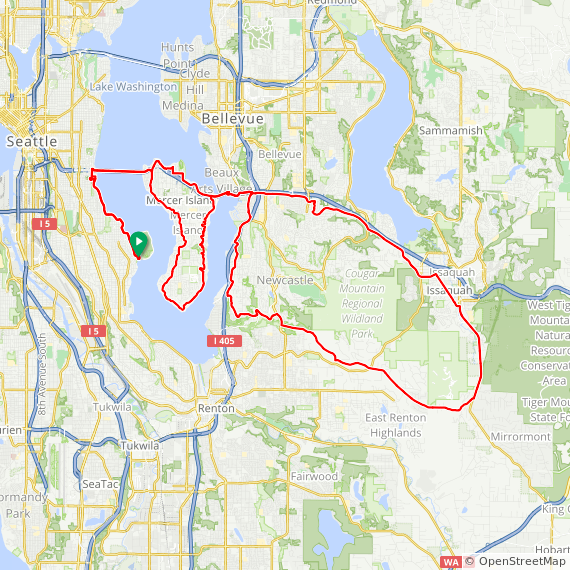 It was a great Sunday afternoon ride with two ferry trips and a nice loop around a good chunk of the Puget Sound. With the shift in the tour route I now was able to take a day off and spend it on the beach. So I did. 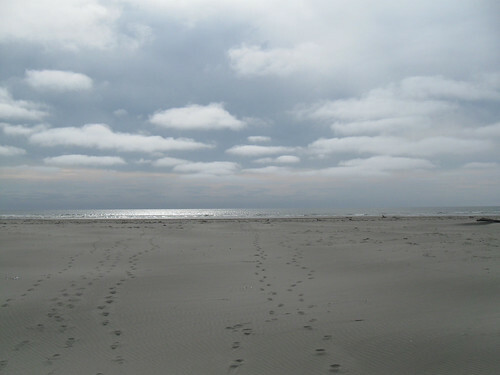 I spent the morning on the beach, walking up and down, taking pictures and letting the constant wash of the surf cleanse my mind. After a few hours on the beach I decided that I’d go out for lunch (the only time on this short jaunt) and rode into Westport where I went to the same cafe I went to last time I was here. On my way back I stopped at the Cranberry Road Winery and Bogwater Brewery. They didn’t have any of their beers ready for consumption yet — they’ve only been around since Nov. 2012 — but had plenty of other brews on tap. 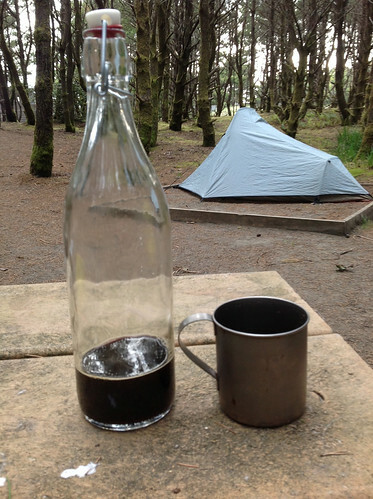 I had a couple and then took a growler of Rogue Double Chocolate Stout back to camp. 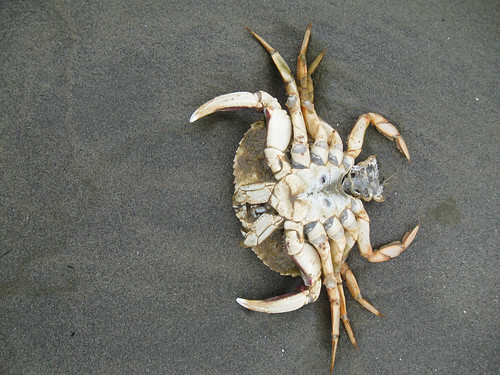 I took another good long stroll on the beach enjoying the rather grey day. It wasn’t too cold, but definitely not as sunny and hot as it had been. The skies began to break up toward the end of the day and it would be much clear on the following day. Back in camp I drank my beer and ate some shelled peanuts while I read news on my iPad. Eventually I made dinner and after cleaning up, took an evening stroll out to the beach. The sun had and it was nearly dark out at the beach. The clouds were rolls of darkness with a faint gloaming in between. After a brief jaunt in the wind and waves it was back to the tent for some reading, journalling and sleep. 19.8 miles ridden today / 143.4 miles ridden to-date. There is nothing quite like waking up in your tent in the woods to the not so dulcet tones of a child bellowing through a megaphone. Fortunately it wasn’t too early and I’d slept pretty decently, but talk about a motivation to get out of bed. It was a grey morning again but would soon clear up to blue skies and warmer weather than the day before. I had another ~50 mile route to ride so I wasn’t in too much of a hurry so I made breakfast/packed up and then walked around the park a bit. I walked to the titular Rainbow Falls, which is more an intense section of rapids than ‘falling’ water but is certainly a nice stretch of the river. I leisurely cleaned up, packed up and headed out around 11 am. 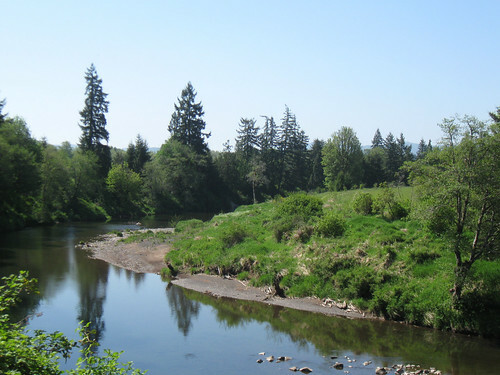 The route took me on a road fronting the Chehalis for a couple of miles before it intersected with the Willapa Hills Trail and I was back to riding on crushed gravel. 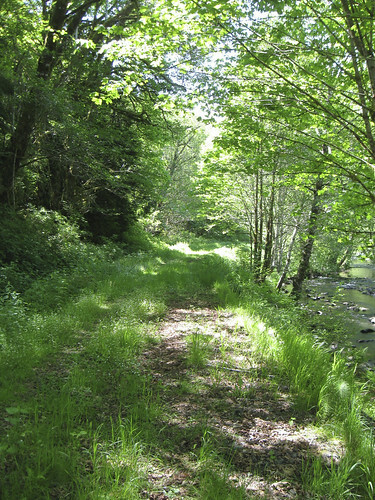 The trail seemed increasingly little used with grass growing through the gravel and stretch that seemed more like a foot path along the river. It was nice scenic riding with little wind and soon sunny and warm. However the trail itself was increasingly loose gravel and at times I found it more amenable to jump onto the chip seal of hwy 6. I rode on the hyw for a few miles and then came across a road grader chewing up the shoulder up ahead and right before I reached it I jumped back onto the trail. About an hour on the trail and I reached the tiny town of Pe El. Now this route I had been given from Google Maps was basically taking logging roads over the Willapa Hills down to the Columbia River. I knew I’d be in this hills come lunch time, so I left the trail and rode into town. There I found a grocery store where I picked up sandwich making supplies and various other eatables. By the time I was finished shopping I figured I’d just ride to the town park and eat lunch. 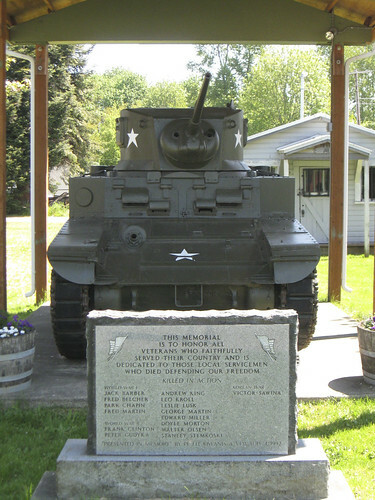 This I did in a park with a WWII era tank as a memorial. Riding back to the trailhead I found that road grader I’d encountered earlier tearing up the entrance to the trailhead parking lot. Strange. There is very clean, cool water at the Pe El trailhead so a refilled all my water bottles with this and returned to the trail. The trail was still gravel at this point but even less used than in the previous section (see here). I was riding a track through tall grass and seemed to be only used by local dog walkers. Now my Google Maps route had me on this for a while and then take a Weyerhauser Company road to a numbered forest road. I wandered around various unsigned roads trying to work this out and ended up on a private Weyerhauser road that I continued on for a bit until I hit a gated maintenance yard. 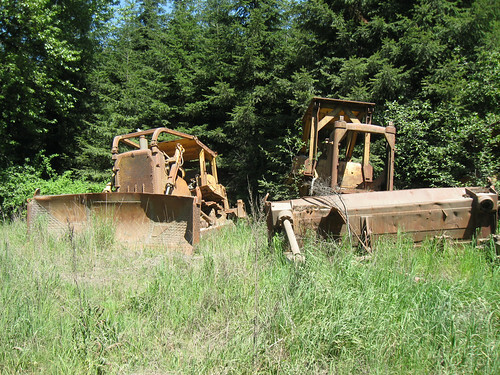 Outside this yard was dozens of abandoned logging and earthmoving machines rusting away in the tall grass. At this point I decided to give up on my pre-planned route (Google Maps: always an adventure). 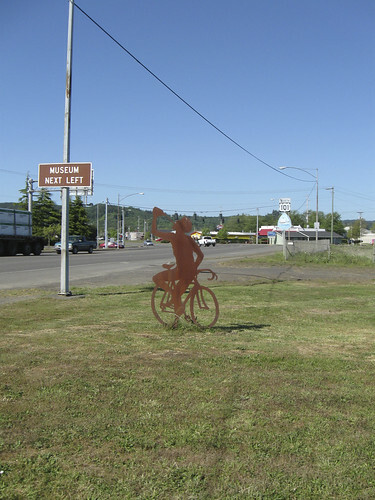 I knew the Willapa Hills Trail ran all the way to Raymond on the coast and I’ve ridden out that way several times. 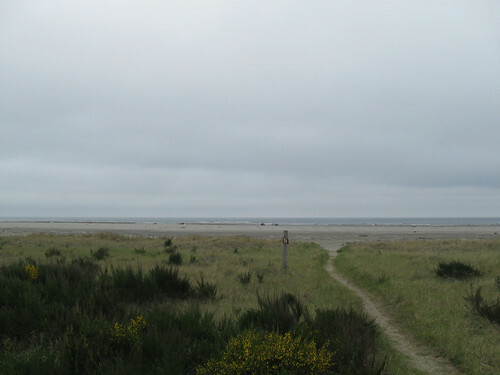 I was figuring I could stick with the trail for an easy ride to the coast and then head to one of the campgrounds out there. So back to the trail I went. 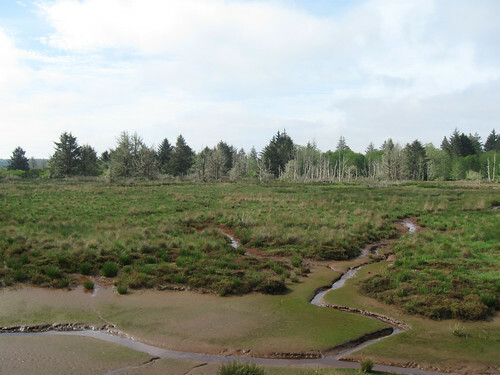 Now the Willapa Hills trail runs over 50 miles all the way to the coast but from Pe El on, it is unimproved and goes from gravel, to ballast to just a dirt track along the river and through the woods. I began to cast around for way back to the road and happily there was an easy escape route to hwy 6 where the trail paralleled it for a spell. Now when I was on hwy 6 yesterday it was chip seal, shoulderless and rather busy. But now all of that was reversed and it was perfectly fine riding. In fact the riding at this point was quite pleasant — it was sunny and warm and the road after a bit of up and down descended into a long valley for the bulk of the days riding. However I didn’t really know how far it was to the coast and where I’d be able to go from there. After many miles of this nice valley riding along the river I hit the small town of Labam where I had a milkshake in the sole cafe/store there and was able to use the WiFi. I found that it was both a pretty fair haul to Raymond where 6 intersected with 101 and there wasn’t any ‘cutoffs’ heading NW or SW. I figured I shouldn’t linger and after finishing my milkshake I was back on the road. 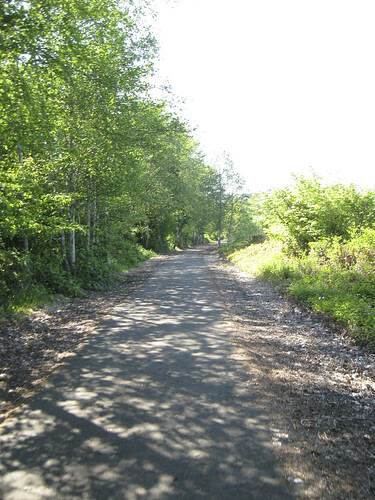 The whole time I’d been riding on 6, the Willapa Hills Trail was alongside in various degrees of deterioration. Mostly ballast at this point, sometimes it looked more rideable than others. The trestles were not improved without a deck and sometimes they were wiped out by the rivers over which they crossed. I have to say though that if they could get this entire trail improved and especially if they paved the entire stretch this would be one of the epically great trails. 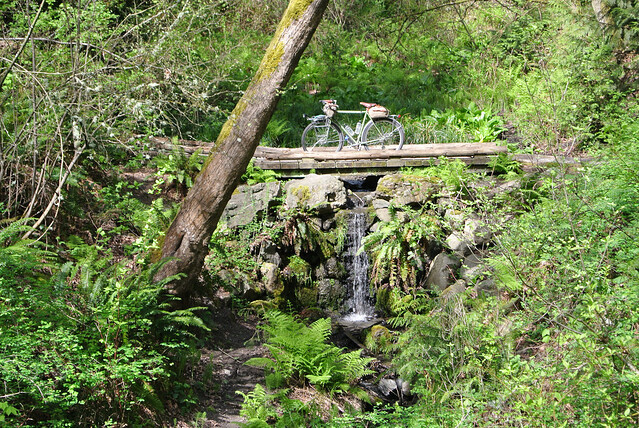 Not just in Washington State but one of the great American trails. The wind began to pick up as I neared the coast as did the hills and the traffic. Happily after one fairly stiff climb I noticed the trail was massively improved and I jumped on it. It soon turned back to pavement (hooray) and shortly I was in Raymond. 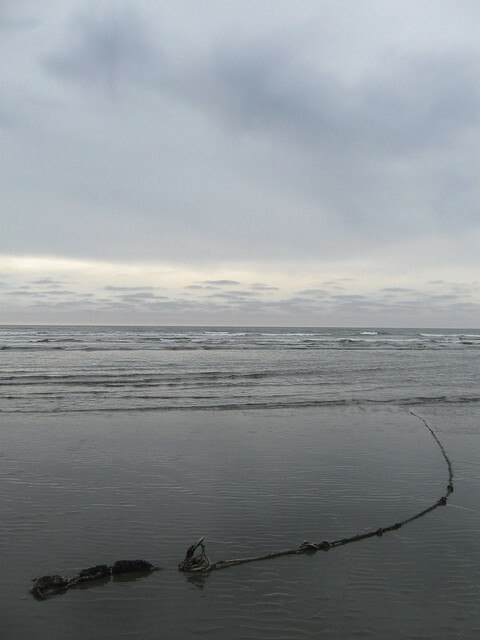 I had determined that it was another 40 miles or so down to Cape Disappointment which had been on my original planned tour route and at 50 miles already ridden I felt that was too much. Plus of course I’d have little other course but to ride back north along the route I’d just ridden south. So I decided I’d head north up toward Westport. I stopped at a cafe in Raymond that offered free WiFi (3G connectivity still not being available) and did some Google Mapping. 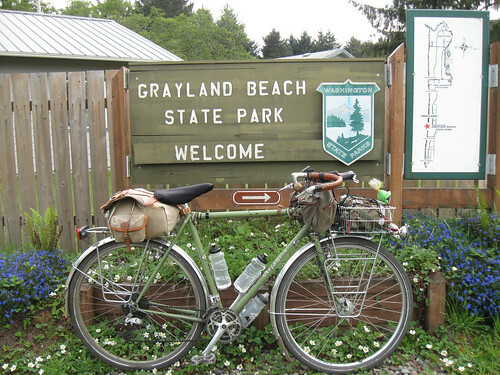 I found that Greyland Beach State Park was a few miles closer than Twin Harbors State Park and as an additional plus I’ve never camped there. So I had a destination which was about 25 miles away. It was around 5pm and while the long days meant I’d arrive with plenty of daylight left it was definitely going to be a fairly late arrival. 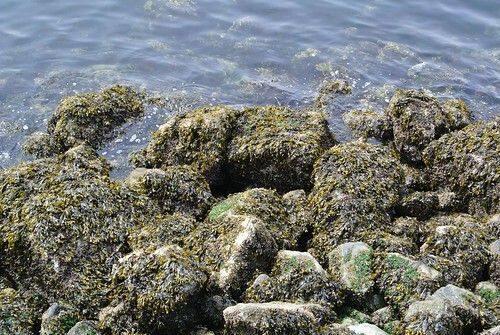 As the crow flies from Raymond to Greyland is not 25 miles, but the road wound along the coast, diving into deep coves and up and down the rocky coastline. 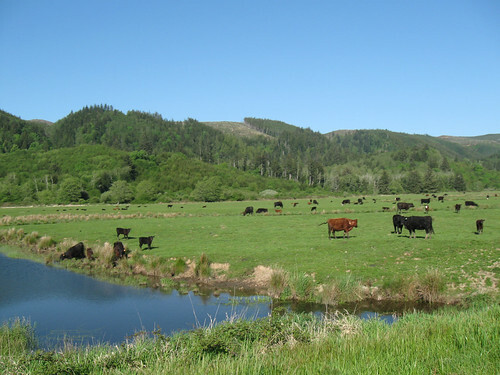 The valley interior was used for farms and pasture and eventually it was forested rocky hills that is so common on the coasts of Washington State. I was mostly riding into the fierce winds off the ocean and into the setting sun and being pretty tapped out at this point it was a tough slog. But the sights were worth it and the roads, which can be very busy, where empty at the this time of day. I was happy when I reached the western extents and turned northwards and not directly riding into the wind. It was from that point only five miles or so to the campground which I can’t deny I was relieved to reach. 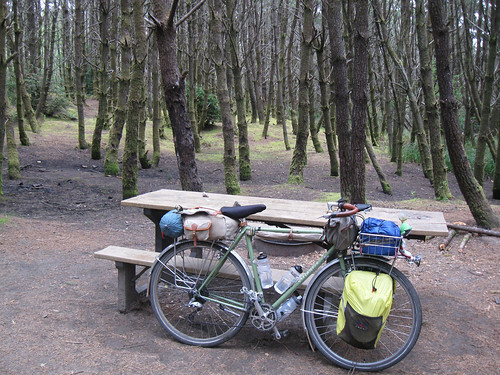 I rode in to the “primitive” walk-in campgrounds which oddly had it’s own parking spaces so you could park and “walk in” to them and pretty directly moved to cooking dinner and setting up. It was dark by the time I’d cleaned up from dinner and I walked the mile or so to the front gate of the campground to pay for the night. Then it was back to my campsite and into the tent for the night. 66.3 miles ridden today / 127.5 miles ridden to-date. Mid-May brought the PNW some unseasonably spectacular weather: about ten solid days in the mid-seventies to mid-eigthies fahrenheit. After going through a weekend in the 80s (F) I felt that sweltering in my apartment was all well and good (I took some top notch twilight rides around town) but that I would enjoy the cooler weather of camping out at night. So I spent some time on Google Maps working out a route and packing up some gear. This was Monday May 5th and I decided that I’d leave on Wednesday the 8th — I had some work I needed to get done on the bicycle before setting out. I spent the next day doing this work along with packing and buying of some supplies. On the bicycle I put my charging system back on, I did a thorough clean of the drive train (plenty of gunk left over from the cross country tour and winter riding), fiddled with the wiring to the rear light, adjusted the front deraillur (there was way too much slack in the cable), cut my kickstand a bit shorter and numerous other minor adjustments. Then I loaded up everything but the food, toiletries and electronics so I’d pretty much be able to depart within about 15 minutes of deciding to do so. I did make some changes to the setup this time around to facilitate some new gear (more on that as the reports progress), primarily moving my tent out of one of the front panniers and onto the free space at the back of the rack. This did free up sufficient space and worked out well enough. It does make access to the saddle bag a bit of a pain, so I tried to keep things I wouldn’t want during the days ride there (clothes primarily). I was pretty much all done by dark and ready for the next days departure. This post will serve as the index for this Micro-Tour and I’ll update it with links to them as I write posts for each day. These should follow on over the next four days, so stay tuned!